The little-sitcom-that-could's exceptional third year hits DVD. 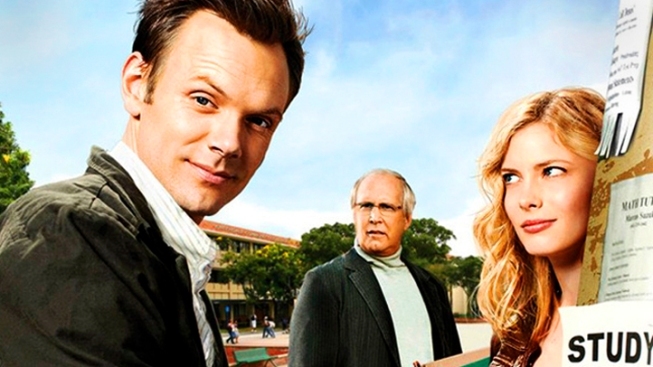 Actor Joel McHale offers a study session on "Community's" very funny Season Three as it hits home video. 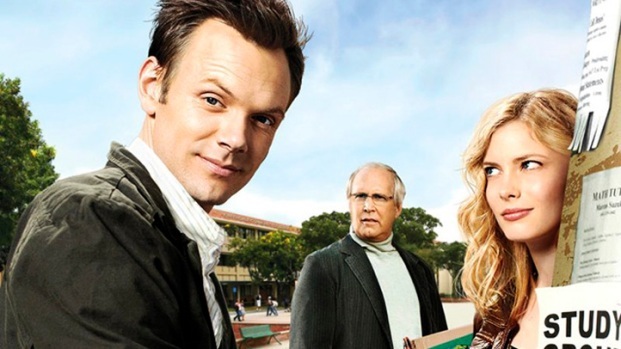 Joel McHale would like to remind the die-hard “Community” fans who are anxiously awaiting season four that they can kill a little time in between watching season three on DVD. The wildly ambitious third season of the NBC sitcom – in which its critically hailed creative high points aren’t always reflected by equally high ratings – arrives on home video Aug. 14, and McHale reflected on the show’s funniest season to date for PopcornBiz, while also hinting at the greatness to come for season four. Do you want me to get up and run around?....Hold on one second…One sec, I'm running. Hold on. One sec…I'm back. Fans of the critically praised NBC comedy "Community" can rejoice. The offbeat series about a community-college study group that becomes an unlikely family returns to NBC Thursday night. Did you guys feel in the making of this season that you were raising the bar on two already very funny prior seasons? I didn't think going in, like, 'Oh, man, what are we going to do?' I never thought that. Obviously the writing is terrific, but I think personally that it's one of the, if not THE most talented – myself not included – casts on television. I'm very arrogant about that, but I knew that we have very capable people that could make funny things happen. How has Jeff's path been a little different, and probably more fun, than what you thought when you first signed on to the show? Has Jeff gone in a very different direction from what you thought in the very beginning? Joel McHale, Gillian Jacobs, Donald Glover, Ken Jeong and others from the cast of "Community" chat at the NBC 2011 Summer TCA party about the guest stars they have lined up for Season 3. I think for the whole show, not just Jeff, no one expected it to become as absolutely creative as it is, from the paintball to the 'Dungeons and Dragons' to the Dreamatorium to the timelines episode to having the musical opening from last year. If you look at the pilot, there's nothing like that in the pilot. It looks like it's just going to be about this group, but what was great was that the imagination just ran wild. I don't think anybody expected that at first, and then as it started going it was like, 'Great!' with the trampoline and all of that. I was just thrilled. The fans seem to really respond to the dense mythology the show has created. Are you entirely up to speed on all the callbacks and in-jokes, or do you have to be reminded on when something was started? Yeah. There's no way that you can keep track of it, there was too much. But with the Beetlejuice joke that took three seasons to make. When I finally saw that all edited together I was like, 'This is the greatest thing that's ever happened!' Or in 'The Bottle Episode,’ when we're looking for Annie's pen, when the monkey hand comes into the shot and takes the pen. I did not see that at all, and then when it was all over YouTube I was like, 'Oh, my God! This is the greatest.' It was one of those things that I couldn't believe when I saw it. It was so perfect. From Season Three, what was your favorite episode to make? And what was your favorite episode just as a viewer of 'Community'? People always go back to the Remedial Chaos Theory – that was my favorite to watch probably. And as far as making, what was really fun was the musical episode, the 'Glee' [parody] episode. That was really fun to make because of all the singing, and it was just something that I would not be doing. No one would ever cast me in a show like that because I don't sing or dance, so that was kind of one of those ones where I was like, 'Huh, I get to be a part of this kind of musical.’ And having Alison Brie dance on you was okay. Do you guys feel comfortable coming in to Season Four, despite some of the creative changes behind the scenes? Yeah, we read the first script yesterday and the script was great. We were all very curious to see what it would be like. It's really good, and so everyone was really happy. Were you nervous at all, or were the new producers able to put you at ease before you even saw the first script? Well, I know the guys. I know David Guarascio and Moses Port. I did a pilot with them, and they're great guys, so I knew that they were funny and in that sense I wasn't worried about it. I knew that these guys could deliver, and a lot of the same writers came back. So in that sense I was confident with the writers, definitely, and then it just kind of came down to what the table read was going to be like. It went really well, and so that was really great. What are you able to tease as far as the new the season? Are there any ideas that you can put out there without getting yelled at? I can't put any ideas out, but I will say that there may be a unicorn and the show is just as ambitious as its ever been. What do we have to do to make sure that this show keeps getting made? If you could speak directly to the fans who've been supportive and to people who should be sampling the show, what do you want to say to them? I don't know what else I could say to the greatest fan base in all of television history. I think after our hiatus last year, they're the reason why we're back. I can't speak enough about how amazing their support has been. When I tweeted the photo of the cover of the first episode. It's called 'History 101,' or that was the working title, I got re-tweeted like 500 times or something, so they still seem to be as vocal as they were. That's all we can ask for, and much like proselytizing , tell your friends about it. The fan support has always been there, and without them the show would not be on.